July 25, 2008-Our Little Bitts group in Australia is making a name for themselves! They have been donating photos and stories, and I decided to devote a page of the site to them! It is a lively, talented and fun group! The very first photo on this page is of Adam Boslem, at age 12, the youngest member of Little Bitts! He is full of life and enthusiasm, and obviously genetically inclined to the water and boats and all things associated with it! He and his family, along with his grandparents, Malcolm and Penny Newbiggin, live on Lake Macquarrie, in Australia. They are building a Candu Jr. together. The building of their boat will also be featured on a page of it's own! 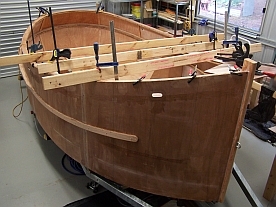 They began their boat about a week or 2 ago and have already completed the box keel and some of the other parts. Adam has been bitten by the "tug bug". It was he who originally found the website and spoke to Malcolm about it. It turned out that Malcolm had always loved tugs, too, and they decided to do it together. 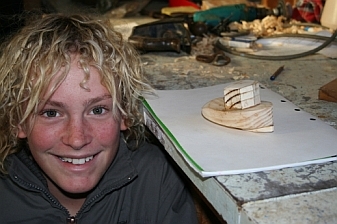 Adam has decided to carve a tug while they are working on the Candu Jr. Below you will see a photo of he and the tug! As he paints it, etc., we will post the photos! You are amazing, Adam!!!! Keep up the good work!!! 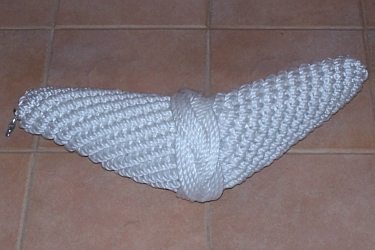 The following photos are of fenders and bow fenders created by Fay Rigg, of Australia! 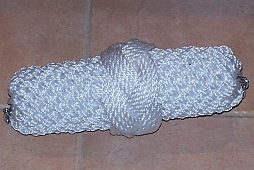 She has enclosed the instructions for anyone interested in making their own. Contact Susie if you would like them! 8-17-08 Here is a photo of the hull of John and Fay Rigg's Candu E-Z to be!!!!! What great progress! 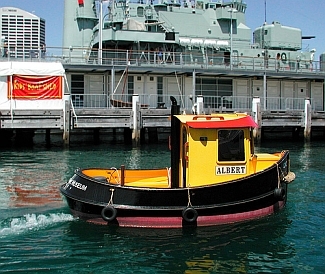 The following photo is of the "Albert" who was shown on our original Little Bitts website many years ago, and was later donated to the Maritime Museum in Australia.